College isn't always easy. There's classes to choose and majors to finalize, tests to study for, and for some - the crippling worry over getting a bid from the right sorority. Overcoming cancer, however, is not on the typical docket. 21-year-old Esmeralda Perez did just that. 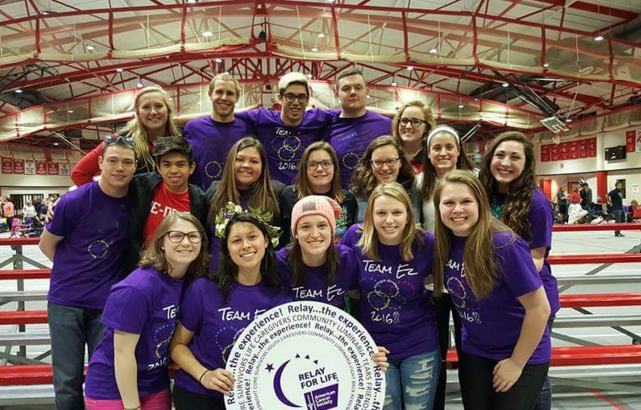 The Carthage College junior was diagnosed with Hodgkin's Lymphoma, a relatively rare cancer that compromises the immune system. The cancer came out of nowhere just a few years ago - launching Esmeralda into routine hospital visits, chemotherapy, and yes - even losing her hair. 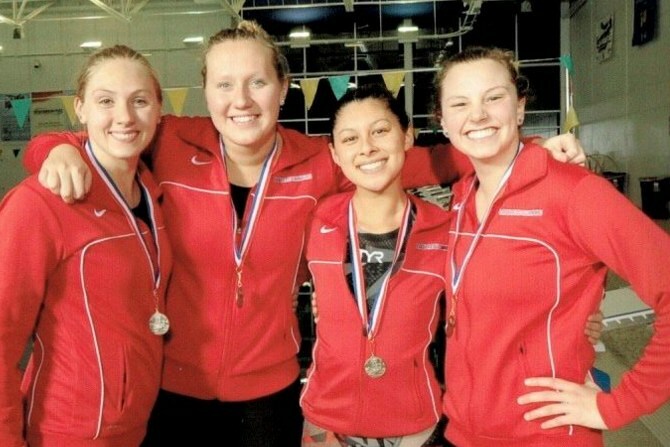 The cancer put an immediate damper on her life and her love (and clear talent) for the sport of competitive swimming. The valiant Esmeralda did not blink. Her many years in the pool taught her more than just how to swim well - it taught her resilience. Much like a swim race, Esmeralda's "competitor" was cancer, and she left it far behind her wake. Milk & Honey's fearless heroine Esmeralda is our very own supergirl, except instead of the cape, she's wearing a TYR racing swimsuit. She is now cancer free and winning swim races left and right. And best of all? She points to her faith as her driving force. Esmeralda has quite the collection of gold medals - both literally and metaphorically - from beating cancer and beating swim opponents. Let's meet the glorious Esmeralda. My whole family swims competitively and it has always kept us very close. My younger brother, sister, and I took on our completely remodeled high school pool and filled up the new record board with Perez. My junior year of high school I was set on achieving new best times in my races and to be able to qualify for the State meet. During the season, I caught a cold that seemed to never go away. I began to feel lethargic, and it was difficult to make it through the day. Then, I started having terrible stomach aches very often. My coach started to get frustrated with me and pushed me harder, and I decided to swim two practices a day with high school and then club immediately after. I assumed my body was done swimming because I wasn’t improving anymore. That is, until I found a bean size lump above my collar bone. I then had two biopsies and a bone marrow test within the next few weeks. I was coming home from school when I noticed my mom and dad were home already. They sat me down and explained that I had Stage 2 Hodgkin’s Lymphoma with tumors leading from my neck to my chest and that I have to go to the doctor to start a treatment plan. The hardest part was breaking the news to my younger siblings. As a family, we hadn’t really experienced cancer and we didn’t know what to expect. The first step was to choose a treatment plan. I still wanted to swim while undergoing treatment, so the doctor recommended a port implant to receive chemotherapy. My summer before senior year consisted of chemotherapy all day Thursday, sleeping the rest of the weekend, and going to practices until the next chemotherapy. The treatment plan was 3 months of chemotherapy with halfway scans. By the time of the scans, my family was grateful to hear my tumors had gone down dramatically in size, and we scheduled a day to remove the port once I completed the last half of chemo. I remember being so excited to be done already when I went in for my surgery. My doctors met with me once I got to the hospital. They looked at my final scans and, as a group, decided I needed to keep my port in because there were no signs of change since the halfway scans. I needed to complete more chemo starting that same day - and it was now an intense form of chemo. I was devastated to hear I wasn’t done, but after a few tears I realized I could get through it and that God would take care of me. 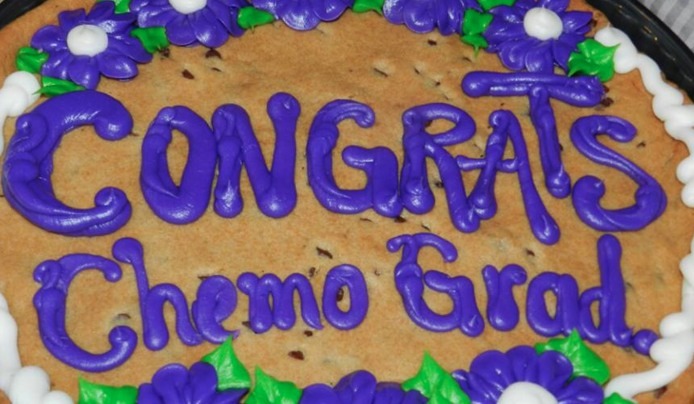 The next round of chemo was definitely stronger. It made me very sick and I quickly lost my hair. I continued to swim (even if it wasn’t much) during a practice, and I signed up for swim meets and swam the shortest races. I couldn’t stay away from my swim friends and family. Finally, I was done with the chemotherapy and once again had a final scan. The tumors were gone but the PET scan still glowed around my heart. To make sure everything was gone, my doctors had me undergo a few months of radiation. Radiation appointments were much faster, and the only side effect I had was thrush in my throat where the radiation was administered. The thrush made it painful to swallow and I started losing a lot of weight until I started drinking Boost to receive protein, which my diet was lacking. Eventually, I was finally done with radiation and my doctors gave me some time to recover from the radiation before having once again another final scan. At this point, I began my college career as a student athlete at Carthage College, which was only 40 minutes away from my doctor. In October, I received the phone call from the hospital that I was finally in remission. It was the greatest news I have ever heard after almost 2 years of fighting cancer. 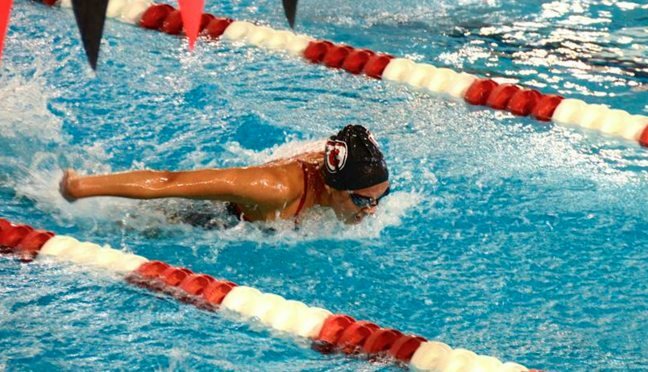 After my diagnosis, I knew I wanted to continue swimming. I had goal times for my butterfly events I was still striving for, and I didn’t want cancer to prevent me from doing so. I knew I had the ability inside me to reach the goal times. As a college athlete, I had all the tools and support to gain my strength back. 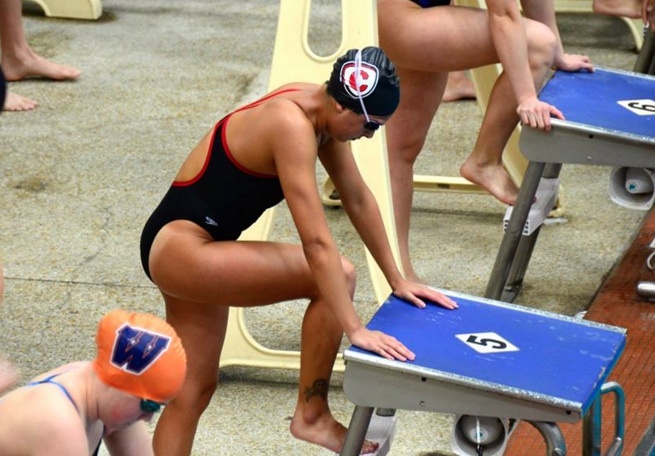 I knew that I had no excuse to miss a practice or give up on a race because I’ve gone to practices and swam at meets while going through treatments. It’s a reminder to always give 100% and use every day to grow. Advice for women trying to overcome hardship? Take one day at a time and always stay positive. We all have days we feel stressed or worried, but we have to remember everything will be okay in the end. I also learned to see the best in every situation, and I think it is important for others to do so. I enjoy taking some time to relax and think about the little things that are going well in my life and how to go forward. Has your faith been strengthened? At the time of my diagnosis, I was very confused as to why I developed cancer and how it was part of my plan. I thought I would be offered a swimming scholarship to a D1 or D2 school out west where the weather is beautiful all the time. Then, I ended up staying close to home and swimming for D3 because I couldn’t leave my doctors just yet. Through it, I learned to trust in God and find the good in every situation while I was undergoing treatment. Therefore, my favorite Bible verses are Jeremiah 29:11 and Romans 8:28. After looking back, I now realize swimming D3 was a much more appropriate fit for me, and I love every one of my teammates. Being close to home allows me to watch my little sisters grow and my superstar little brother that is becoming an excellent swimmer. I am currently studying psychology and biology at Carthage College, and I hope to attend graduate school in a Genetic Counseling Master’s program. One day, I hope to be a Cancer Genetics Counselor and work at a Children’s Hospital because I loved everyone I met at my Children’s and I want to have a similar impact on others. Read more about Esmeralda here.